Learning how to slow down and be mindful and aware is a very helpful tool for young children and people of all ages. 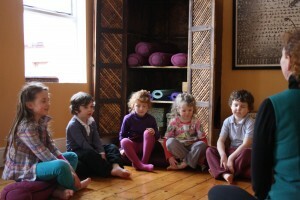 In this course children learn the important tools of mindfulness such as intention, attention, gratitude and purpose. Children will learn to handle difficult thoughts and emotions, and develop kindness towards themselves and others.They will learn to pay attention to the present moment with openness, curiosity and warmth and this is encouraged throughout the course. Weekly Kids mindfulness classes on Wednesdays in the Ardilaun Hotel in Galway. A course is for six weeks and costs 45E. Minimum age is 6 as this course is for slightly older children. Bringing the mats into the shape of a sun we do salutations to the sun, followed by lots of yoga poses, breathing techniques and a variety of meditations. The focus is on helping the childs body to stretch and strengthen while also slowing down the mind and learning to relax and learn calming techniques that can be used at any time. Classes are on Wednesdays at 4:45 in the Ardilaun Hotel in Galway. A course is for six weeks and costs 45E. Minimum age is 6 as this course is for slightly older children.